KL. Raja Ponsing who had already written and published two books – first of its kind photography books in Tamil “Digital Olipadathuraiyil Vetriperuvathu Eppadi” and “Kasu Kottum Camera” for the professional photographers and taken it to the most deserving photography community of Tamil in India and abroad. ‘Starting with your DSLR camera’, is his yet another expression of photography and effort to spread the message of photography. He is the founder and director of Ambitions 4 Photography Academy. Offers a simple, practical and informative approach to photography without making the reader go through too many technical jargons. The book is an ideal quick reference guide as the explanations and narrative are simple and to the point. The book will be a very useful tool for the beginners and hobbyists. 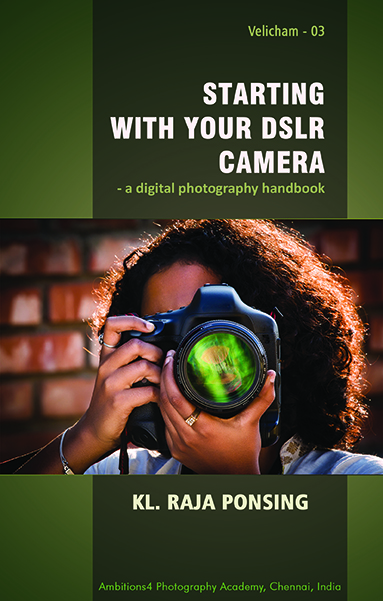 Makes DSLR photography easy to understand and effective to implement. Covers all that is required for a first time users of DSLR cameras. Contains about 360 photos & illustrations laid out in a simple and aesthetic design for easy reading and understanding. Ideal partner for budding photographers to boost their confidence in photography. This will be a value addition in any library. The concepts explained in this book can be easily adapted to most of the visual arts making it a unique handbook catering to multiple genres of art. Visit the official books page to know more about the book or order one.